With AutoDRAW you can automatically create drawings for Autodesk® Inventor® parts and assemblies. AutoDRAW can detect the parts and assemblies for which you have not created the drawings, and can help you create them using a template you define. Select your main assembly and relax while AutoDRAW runs through all the models in your design and creates the missing drawings for you. The drawing layout can be customised for assemblies and part drawings. 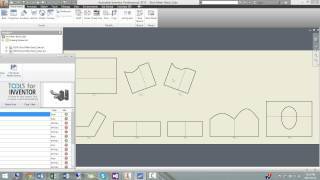 A new function to generate a single sheet metal flat pattern drawing for CNC / cutting purposes. I just download the trial version and it works great. I am to get my boss to buy a copy but I want to know how much it cost per 1 or more like 10 if there is a discount. 1. Scale is invented, is there a way to change the scale from 0.1:10 to 1:10 automatically. 2. Part list drop point ? I want it to be placed in the lower corner. I often make weldment drawings that will have the main weldmaent on a page then all of the component views on the same drawing. Is it possible to do this with this program? Hi Aamal, Thanks for the feedback. Currently, that will have to be done manually. You are welcome to email me so we can chat about your requirement and see if we can add something for you to make it easier to do what you want to do. Hi Aamal,&#13;&#10;Thanks for the feedback. Currently, that will have to be done manually. You are welcome to email me so we can chat about your requirement and see if we can add something for you to make it easier to do what you want to do. I like this app. save me a lot of time. can you tell me where i can download the full version please. Great program for quick and easy making of drawings. When you remove a part from an assembly it will disapear from the program as it should. But the drawing stay's in the folder of the assembly. It would be awesome if drawings of parts that are removed from the assembly are also removed from the folder it was in. This way you don't need to do this by hand. Hi Piet, Thanks for the feature request. I have added it to the list of features to be added in a future release. Thanks! This is a great app, time saving, after this app placed the assembly or part on the template. You need to put everything on place for better but still a huge time saving. Thanks and also a great service. This is an addon I like a lot and use often. The 2016 edition is a nice update. I ' have a simple suggestion for improvement that could be another big time saver. When selecting the drawing template , the addon could look if it holds any iLogic rules and presents all of them in the UI. The user could then select the rules he would like to run when the template is used , with the options at file open , close or other etc. This is great however, I would like the option to be able to save a drawing as its part number and not the file name, is this possible. With the sheet metal it would be more useful if it brought in the dimensions for the flat pattern. That to my shop at least is the most crucial. Also if you could have them all put onto one drawing for shop blueprints. I use this program to save a large amount of time. No more searching the drawing folders to ensure you have all the idw files for your models. 1.) It places a center mark on everything that may or may not be a hole. 2.) The views are: 3 view ortho with the iso in the bottom right corner wth? 3.) Sometimes it creates views that are scaled so large that they overlap and extend way past the boundaries of the sheet. 4.) It creates the drawings in the folder where the source file is, this means that you can have these drawings located all over the place, and subsequently have to hunt them down one at a time. 5.) This company will snag your email address and spam you every day. 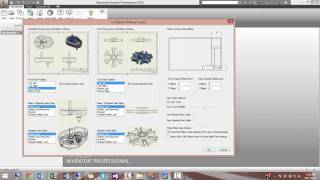 Hi Mike, Answer to your issues: 1) AutoDRAW V2 has more center mark settings and this can now be set to cater for various conditions exactly like inside Inventor. 2) Thanks for this feedback! The next version of AutoDRAW will cater for view placement options. I am interested to hear how you place your views? That way we can ensure that your needs are catered for in the next version as well. 3) The view scaling algorithm has been tweaked a bit in AutoDRAW V2 so it should be much better. Give it a go and let us know what you think. This is a work in progress and to try and cater for all conditions is very difficult. In time this will get better. 4) In AutoDRAW V2 you can now set the drawing output folder. 5) We will and have not ever spammed anyone and it’s certainly not in our interest to do this at all! We will only notify people of new versions of our apps and other app related news. Please contact me directly if you need any assistance. Facil de usar , evita esquecer qualquer desenho existente do conjunto.